ABOUT THE PRODUCER We sometimes assume that the great, historic producers in Italy are all well-known in the U.S. 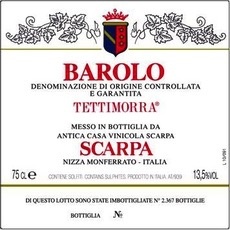 But ask the old timers: "I remember Scarpa…" Antica Casa Vinicola Scarpa has been producing traditional, aristocratic wines in the Monferrato hills of southeast Piemonte for 150 years. They have vineyards, farmed organically, in the Langhe as well as the Monferrato. Mario Pesce, admired by both Giacosa and Gaja, made Scarpa’s reputation in the late 20th century, and today Maria Pier Zola and her family carry on his tradition of aging all the wines for years, and sometimes decades before release. 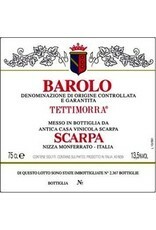 Traditional sometimes means 'rustic', but that's not the case here; Scarpa produces elegant wines with arrow-like acidity and well-aged tannins. Bottle evolution and vintage characteristics emerge instead of pointillist fruit.